Disclosure I am a participant in the Amazon Services LLC Associates Program, an affiliate advertising program designed to provide a means for us to earn fees by linking to Amazon.com and affiliated sites, this post may contain links. At no cost to you! 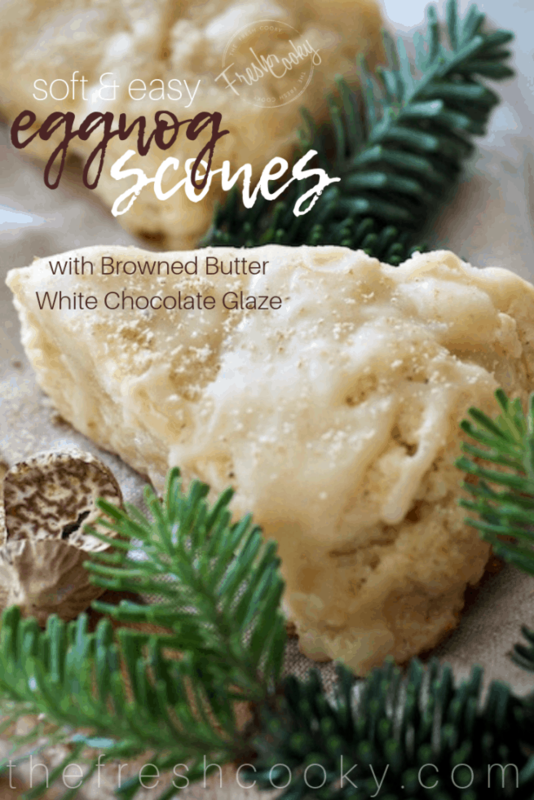 Elegant Eggnog Scones with Browned Butter White Chocolate Glaze are a simple, yet decadent holiday treat. Morning or afternoon you will enjoy these soft, buttery, lightly spiced eggnog scones, simply drizzled with a delicious browned butter, white chocolate, eggnog glaze and dusted with freshly grated nutmeg! In case you can’t tell I’m a big huge fan of scones, not only are they an easy quickbread to make, but they whip up in a jiffy and are freezer friendly! Try my Maple Pumpkin Scones or my popular Strawberry Buttermilk Scones. But since it’s Christmastime and the holiday season, adding seasonal eggnog just plain makes sense! Paired with fresh grated nutmeg and trickled with this incredible browned butter white chocolate glaze, you’ve got the makings of something great! 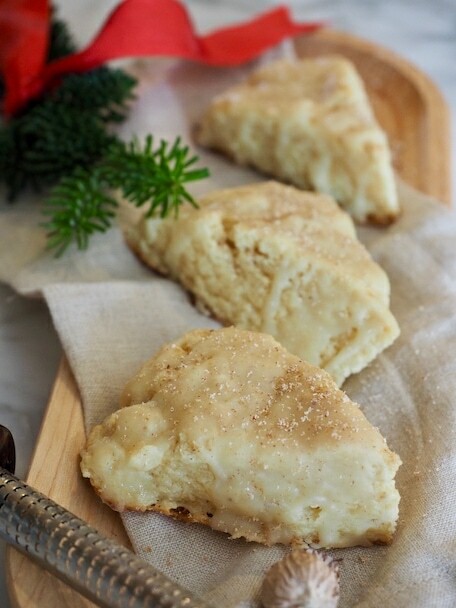 I made these eggnog scones for the first time last Christmas, I never had time to post the recipe but they were delicious. I made them again for a breakfast that I hosted for my dear, sweet Bible study friends. Everyone brought something for our breakfast potluck and my contribution were these soft, buttery eggnog scones! 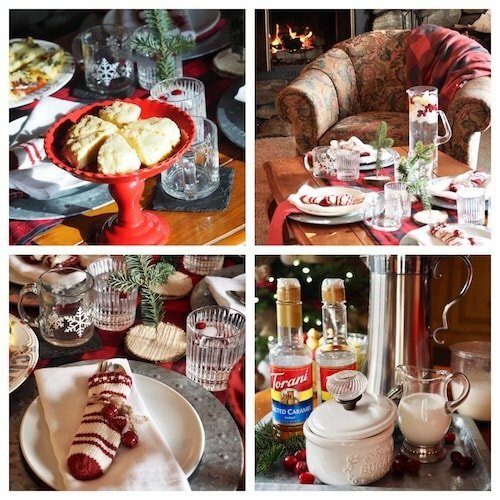 I enjoyed setting the table in the family room, with a fire blazing (requested by Patty) and comfy chairs with a little bit of whimsy in the table settings. Change it up occasionally! We love having meals in our family room, it tends to evoke different and new conversations. Try something different this holiday season! Spread a picnic blanket in your family room or den and make a fun meal out of it! Bonus points if it’s near the Christmas tree! 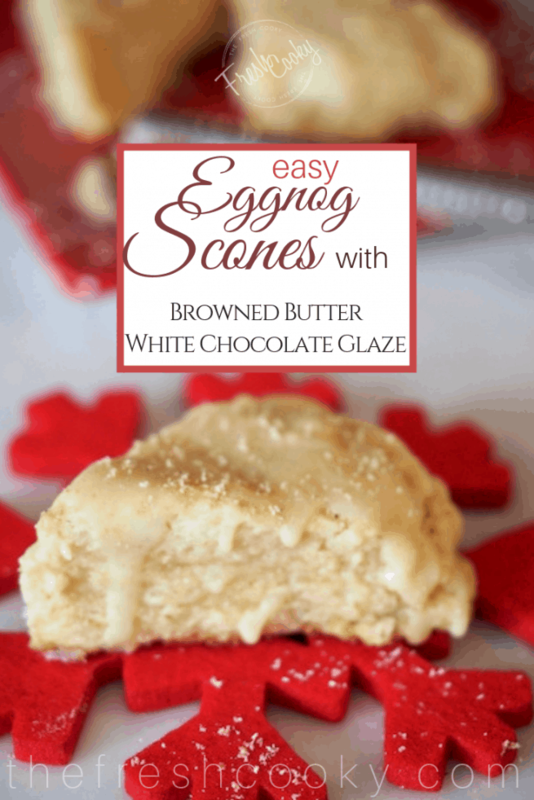 But I digress, let’s get you making your very own soft, buttery eggnog scones! 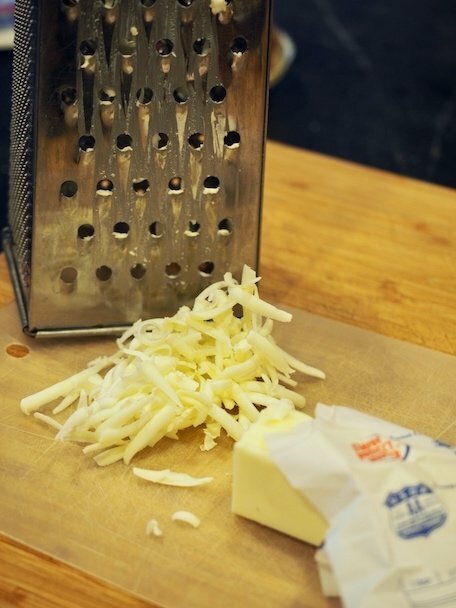 Grate your butter (or dice into small cubes) onto a flexible cutting board and place in freezer until ready to use. In a medium bowl measure out your all-purpose flour, all natural cane sugar, baking powder, salt and freshly grated nutmeg, whisk to combine. 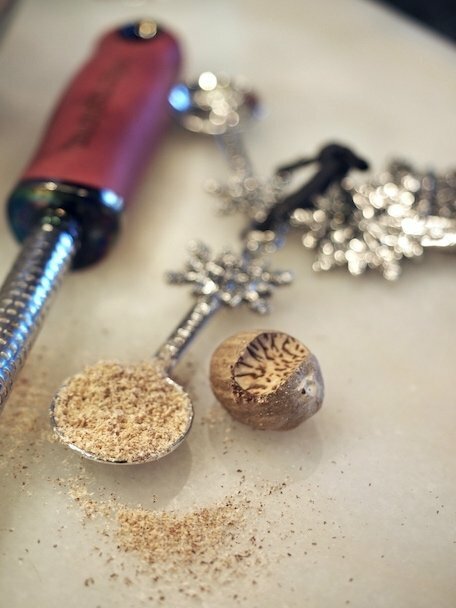 Aren’t these snowflake measuring spoons the cutest? I received them as a gift last year! 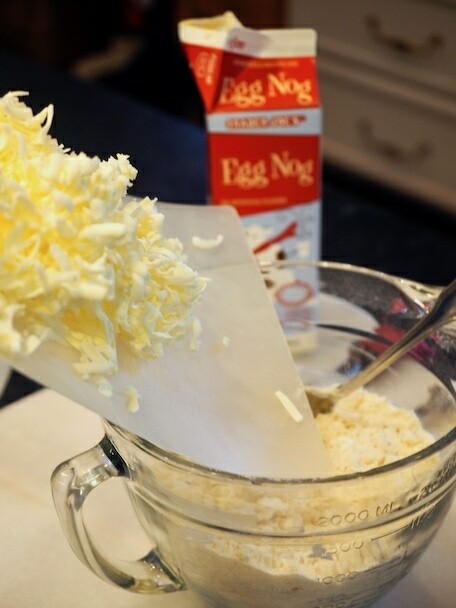 In a 1 cup glass measuring cup, crack an egg and pour in eggnog until you reach 1/2 a cup, it’ll be about 1/4 cup of eggnog. Beat with a fork until combined, set aside. 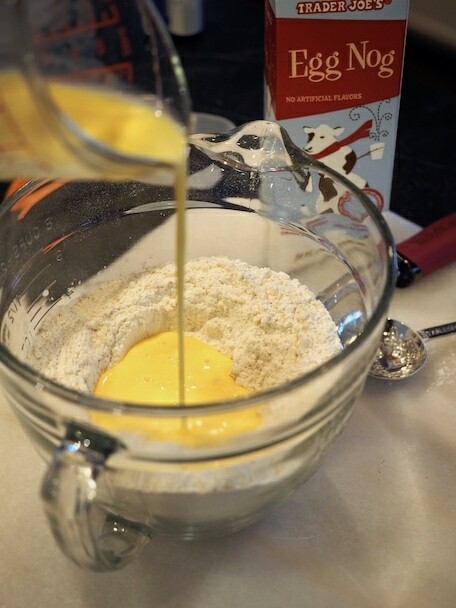 Making a well in the center of your dry ingredients, pour in the egg and eggnog mixture, tossing gently with a fork until liquid is distributed. *Set aside any leftover egg/eggnog mixture for brushing scones later. 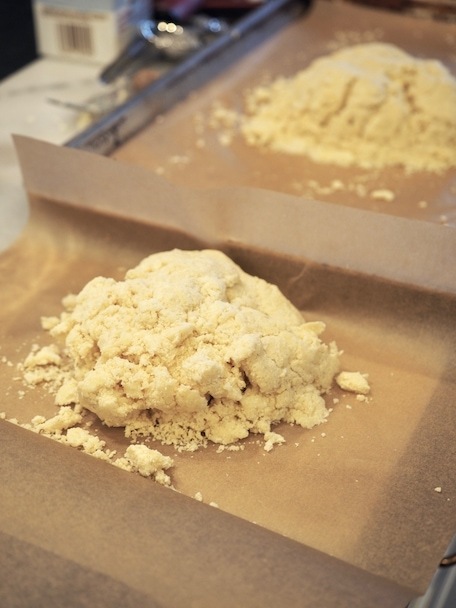 Remove your grated or cubed butter from the freezer and mix into the scone mixture, using a pastry cutter or your hands. Note | If your hands are warm, try rubbing them with a few cubes of ice to cool down or continue with the pastry cutter. Mixture will be dry and crumbly. Continue to mix quickly until pea sized pebbles are formed. 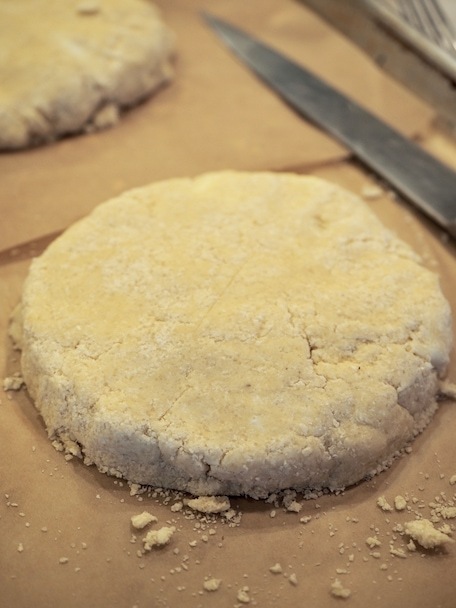 Pour the dry, crumbly mixture onto a parchment lined sheet pan and knead together a couple of times, just until the dough starts to hold together, it will still be quite crumbly (this is how you want it for soft, tender scones) and pat into a log. Cut in half. Don’t overmix! You want little chunks of butter throughout the mixture, not a pastry dough. Pat each half into a disc about 3/4 inch thick, wrap in parchment or plastic wrap and place in freezer for 20-30 minutes. Preheat your oven to 400°. TIP | Second batch of scones may just be frozen from this point, wrap well. When ready to bake, simply remove, brush with eggnog and bake as directed, maybe a minute or two longer. Remove disc from freezer and slice into 4, 6 or 8 wedges. I always go for smaller, bite sized scones. Using a small spatula, scoot the scones away from each other, so that edges are not touching when baked. Add a few additional teaspoons of eggnog to the egg/eggnog measuring cup you *reserved earlier. 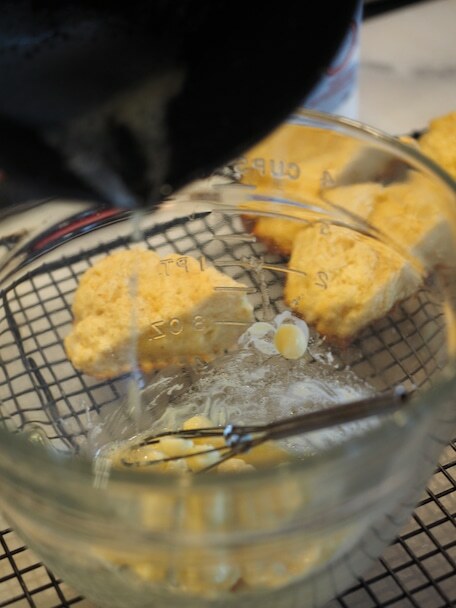 Using a pastry brush, lightly brush each scone with this mixture, it will give the scones a slightly shiny appearance, if desired sprinkle with a little fresh grated nutmeg, if you don’t have a microplane just use the small grate side on your grater. Bake at 400° for 10-12 minutes until lightly golden at the edges. Allow to cool for 3 minutes on the pan, then carefully move to cooling rack. Allow to cool while you make the glaze. In a small microwave safe bowl add your white chocolate and microwave for 30 seconds. Brown your butter over medium heat it will just take a minute or so since it’s so little butter. Set aside. Pour browned butter into white chocolate and mix to finish melting until smooth. 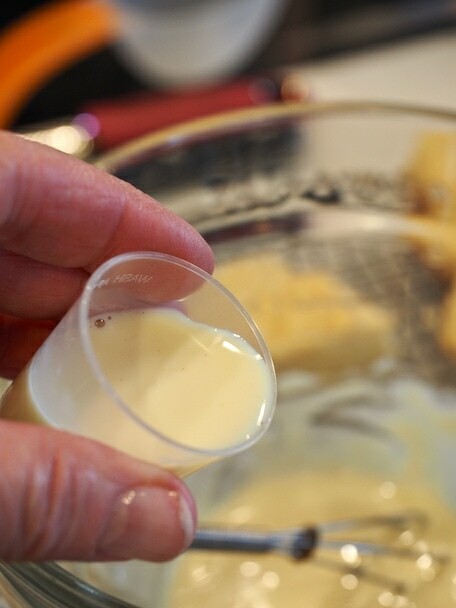 Add in your eggnog, just a titch at a time and mix until desired pourable thickness. If it gets too thin, allow to cool for a few minutes until thickened. 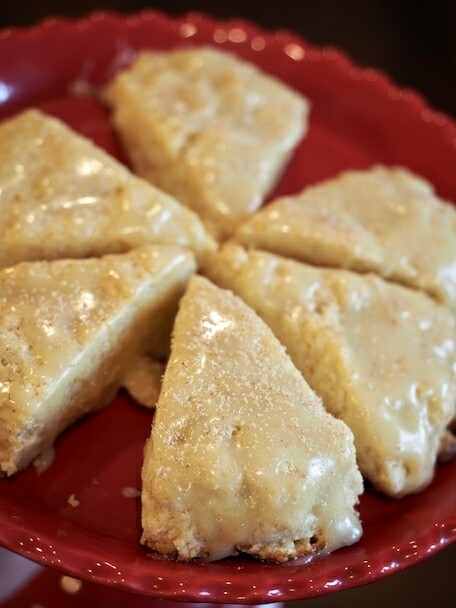 Drizzle on scones and sprinkle a little more freshly grated nutmeg over the drizzled glaze. Or if easier, pour into baggie, snip a tiny hole off the corner and squeeze onto cooled scones. NOTE | If the scones are still warm, the glaze will melt into the scones (personal favorite). If you prefer a drizzled look then cool scones completely before drizzling with glaze. Store scones in airtight container on counter for 2-3 days, though best eaten on day made. Baked scones may be frozen, apply glaze after thawing. Elegant Eggnog Scones with Browned Butter White Chocolate Glaze are a simple, yet decadent holiday treat. 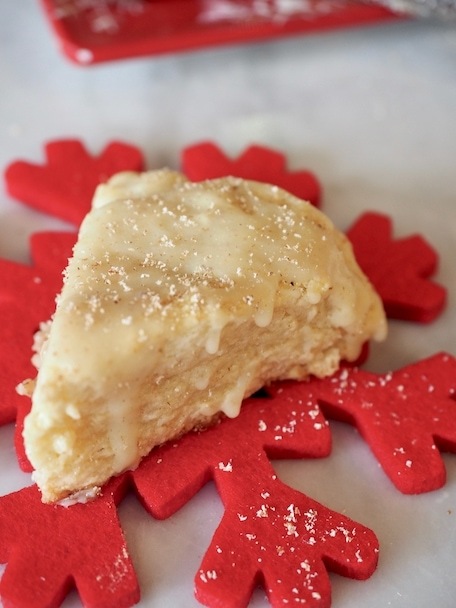 Morning or afternoon you will enjoy these soft, buttery, lightly spiced eggnog scones, simply drizzled with a delicious white chocolate glaze and dusted with freshly grated nutmeg! In a medium bowl measure out your all-purpose flour, all natural cane sugar, baking powder, salt and nutmeg, whisk to combine. 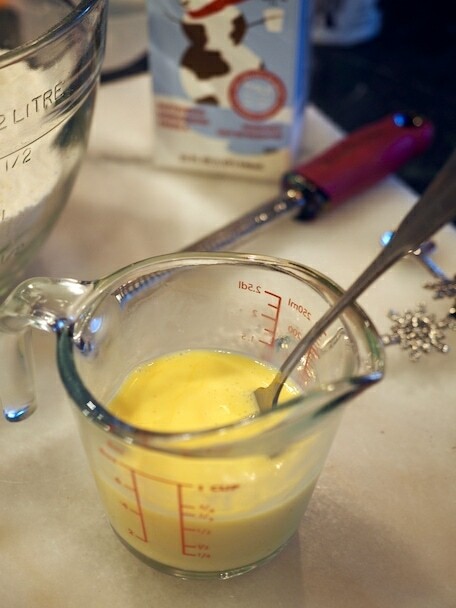 In a 1 cup glass measuring cup, crack in an egg and pour in eggnog until you reach 1/2 a cup, about 1/4 cup of eggnog. Beat with a fork until combined, set aside. Making a well in the center of your dry ingredients, pour in the egg/eggnog mixture, tossing gently with a fork until liquid is distributed. *Set aside any leftover egg/eggnog mixture for brushing scones later. 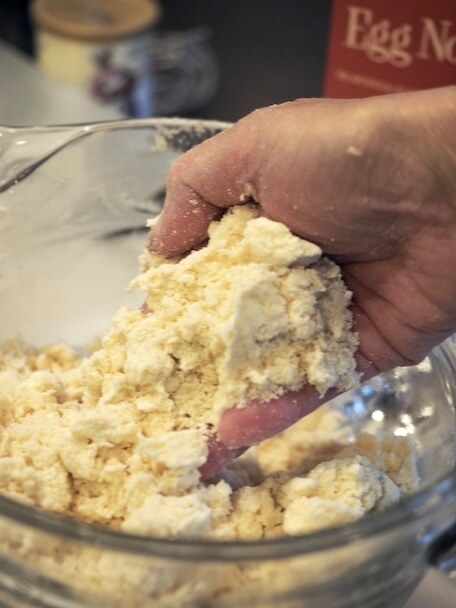 Remove your grated or chopped butter from the freezer and mix into the scone mixture, using a pastry cutter or your hands. Note | If your hands are warm, try rubbing them with a few cubes of ice to cool down or continue with the pastry cutter. Mixture will be dry and crumbly. Continue to mix quickly until pea sized pebbles are formed. Second batch of scones may just be frozen from this point, wrap well. When ready to bake, simply remove, brush with eggnog and bake as directed, maybe a minute or two longer. In a small microwave safe bowl add your chopped or white chocolate chips and microwave for 30 seconds. Brown your butter over medium heat it will just take a minute or so with it being such a small amount of butter. Set aside. 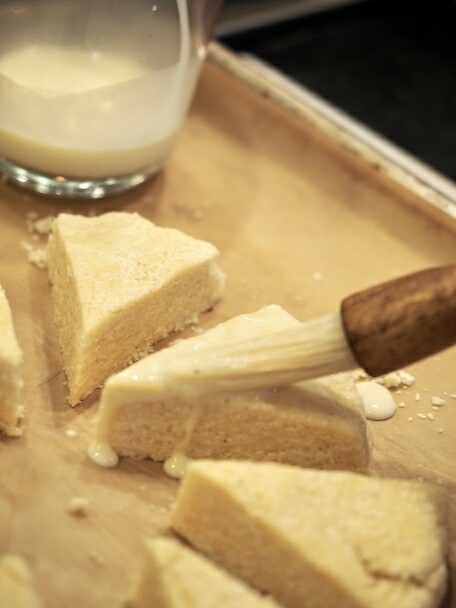 Pour browned butter into white chocolate and mix with fork or whisk to finish melting until smooth. Add in your eggnog and mix until desired pourable thickness. 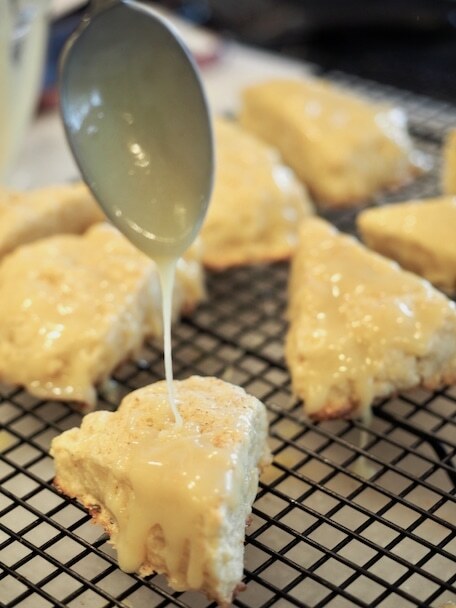 Drizzle on scones and sprinkle a little more freshly grated nutmeg over the drizzled glaze. Serve immediately. I have used both white chocolate bar and chopped the chocolate as well as white chocolate chips and not chopped, both have worked fine for this recipe. Double the glaze if you are baking both batches of scones at once. The recipe is enough to lightly drizzle the scones, if a heavier coat is desired, double the amount of the glaze. TIPS for baking frozen scones | Simply remove from freezer, placing on parchment lined sheet pan, thawing just enough to slice into wedges. Brush with a little eggnog and bake in a preheated 400 degree oven for 10-12 minutes, may require 1-2 additional minutes baking time, remove, cool and drizzle as directed above. These were amazing ? the perfect texture, with a hint of creamy egg nog! Delicious!! I’m going to hire you to write descriptions for me!! Thanks Patty! !